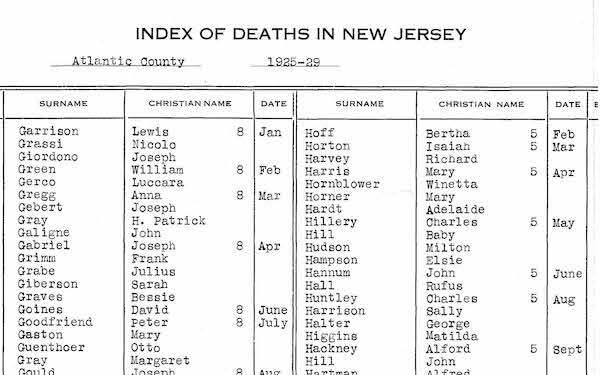 A free searchable database of 1,275,833 deaths in the state of New Jersey between 2001-2017, and over 500,000 free digitized images of the death index for the years 1901-1903, 1920-1929, and 1949-2000. Looking for information on somebody who died in New Jersey? You can do a search in the database for records of more recent deaths, or browse through the digitized images of the index for older deaths. You need to enter at least one given name or surname in order to see search results. If you fill in a start year, you need to fill in an end year too, and vice versa. If you fill in a start age, you need to fill in an end age too, and vice versa. If you're looking for information from earlier years, you can browse through the scanned images. The two raw CSV data files that are used in this database are also freely available for download: 2001-2006 and 2006-2017. There is some duplication of 2006 death data. All fields are optional, only fill out as much as you know. Soundalike surnames and spelling variants are automatically searched. For example, a search for the surname Chang will also bring up results for Zhang and Chan, a search for Schwartz also finds Swartz, a search for Russo also finds Rousseau, etc. Common nicknames are automatically searched, too. For example, a search for the given name Bill will also bring up results for William, Will, Billy, etc., and Rebecca will find Becky, Rivka, etc. You can use an asterisk (*) as a wildcard character to search for partial names. For example, a surname search for *berg will match surnames like Greenberg and Eisenberg, or a search for a given name like Jo* will match Joanna, Josephine, JoJo, etc. You can also use a wildcard in the middle of a name, like K*m to find Kareem, Kettleman, Keenam, etc. Note that the soundalike name suggestions will not be as precise if you are using wildcards in your search. Only the top matches from within the first 250 search results will be displayed. Sorry, no results found for this search query. Please try a different search, perhaps one with fewer parameters. 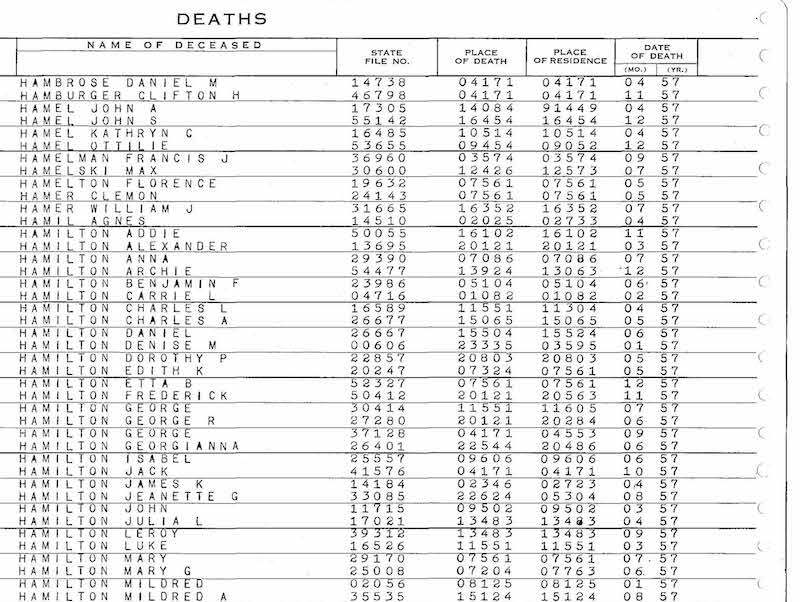 The records of the death index for 1901-1903, 1920-1929, and 1949-2000 are currently only available in digital image format. Luckily, they're easy to use and completely free. In 2016, the non-profit organization Reclaim The Records obtained microfilm copies of the data for these years from the New Jersey State Archives in Trenton, and the non-profit organization FamilySearch donated the microfilm digitization equipment and labor, thereby creating the first-ever digital copies. The information provided by these early years of the death index is very basic. 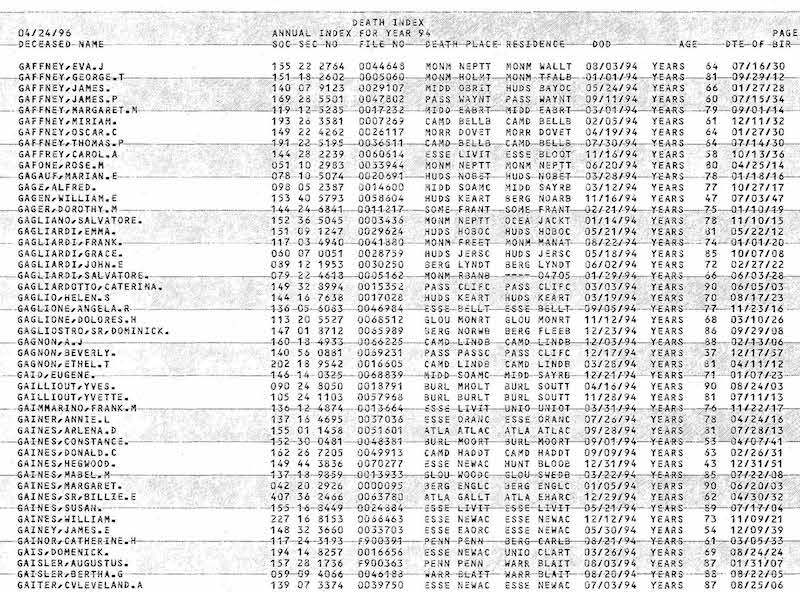 However, 1902 is the only year of the index that provides information as to the race of the deceased person, denoting every African-American with the notation "(B)" (for "Black"). No other racial categories are noted and no other years of the state index do this. The New Jersey Department of Health could not locate the death index data for these years, even under a New Jersey Open Public Records Act (OPRA) request. The images for these years are now being sought from the reference microfilm copies at the New Jersey State Archives in Trenton. If they can be located, microfilm copies will be acquired, then digitized, and then put online for free public use, possibly by the end of 2018. These records were obtained from the New Jersey Department of Health under an Open Public Records Act (OPRA) request. The death index for the 1920's is unusual in that the records are grouped in five-year periods, 1920-1924 and 1925-1929. Within each grouping, they are then separated out by locality name, such as county or major city. Within each locality, they are broken down by year, as represented by the single final digit of the year, such as "4" for 1924. And finally, within each of those years inside each of those localities, the records are then listed alphabetically by surname. Note that half of the 1920-1924 index is missing, as the New Jersey Department of Health could not locate their own copy of the information. A copy of the missing document is being sought from the reference microfilms at the New Jersey State Archives and if found, will be digitized and put online, probably by the end of 2018. 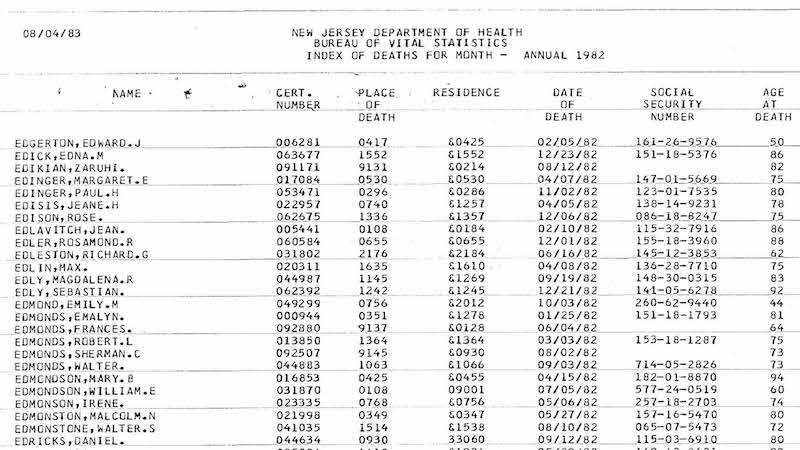 The New Jersey Department of Health could not locate the death index data for these years, even under a New Jersey Open Public Records Act (OPRA) request. It seems unlikely that even the New Jersey State Archives has a copy of the index for these years. However, they do have reference microfilms of the actual death certificates for these years. In late 2018, Reclaim The Records will be exploring legal options to see if there is any way to force the state to re-create this missing index data. These records were obtained from the New Jersey Department of Health under an Open Public Records Act (OPRA) request. These years of the death index supply only basic information, including the month and year of death, but not the exact day. They also provide numeric locality codes for the place of death and place of residence. Use this locality code master key (used by the state between 1949-1984) to translate that code into a named location. Starting in 1968, the state death index starts to provide the exact date of death, not just the month and year. Place of death and place of residence are still provided as numeric locality codes, so you'll still need to reference the state's locality key for 1949-1984. The place of death and place of residence are still provided as numeric locality codes, so you'll still need to reference the state's locality key for 1949-1984. Starting in 1985, the state death index stops using those annoying numeric locality codes for the place of death and place of residence. From this point on, the first four letters of the county and the first five letters of the town or city are explicitly spelled out. Another helpful change: starting in 1985, the deceased person's exact date of birth is provided, where known. Also, the age at death will now state whether the number refers to age in years, age in months, or age in days. In 1999, the state death index starts to spell out many more characters of the county name and the town or city name for both the place of death and the place of residence, not just the first few characters. This record set is only the index to New Jersey death records. 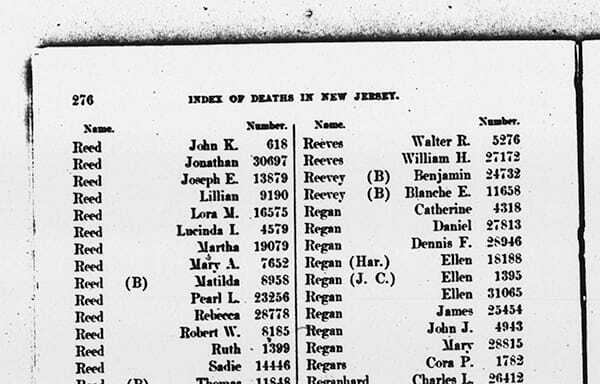 If you find a name of a relative or other person of interest in this index, you can then place an order for a copy of the original death certificate, which will have much more information on it, such as the person's place of birth, the names of the person's parents and spouse, and their burial location. For copies of records from May 1848 - December 1917, you can order online directly from the New Jersey State Archives in Trenton. If you want a non-certified record from 1918 - 1955, you can either go to New Jersey State Archives in Trenton yourself, or you can hire a genealogist to go on your behalf, to get a non-certified print-out copy made from a reference-only microfilm. Unfortunately, the New Jersey State Archives staff are not allowed to provide this record copy to you, so you cannot order it from them by mail or phone, but you or someone else who is actually in the building can print it. If you want a non-certified record from 1918 - 1978, you can order a "genealogy" copy directly from the state of New Jersey, but you can only place the order by mail, and it is not expedited. You will have to provide your official identification with your order, but you won't have to prove your relationship to the deceased if the death was more than forty years ago. This method may cost somewhat more than going to the Archives or hiring someone to go to the Archives. If you want a certified record from 1918 to the present, you will need to order online directly from the state of New Jersey and you will have to provide proof of both your identity and your relationship to the deceased. This method is usually pretty quick, but it's also the most expensive one. It's also the only option if you want to use the certificate for any kind of legal or identification purposes, such as probate or applying for dual citizenship. Interested in learning more about Reclaim The Records and our work to obtain and publish genealogical and archival data through Freedom of Information requests? Stay up to date with the latest news by signing up for our mailing list. We send out newsletters about once a month. If you live in the US, in which state or territory are you a resident? Did you find this website helpful? If so, please help us bring even more public data back to the public. We're Reclaim The Records, a 501(c)(3) non-profit organization founded in 2015, made up of genealogists, historians, researchers, journalists, and teachers. We use Freedom of Information requests to acquire and publish archival data sets, public records that have never before been available, or not available online. We focus on government agencies, archives, and libraries that have previously been unwilling to share their data. And if they don't follow the law, we file lawsuits to make them turn over the records. As of July 2018, our organization has filed five lawsuits against government agencies, with three settled in our favor and two still pending. We put all the data we win online for free public use, without usage restrictions. After all, our taxes already paid for it and it belongs to all of us. This data is in the public domain. There are no usage restrictions or copyrights attached to it. Feel free to use it however you'd like. But if you put it on your website or transcribe it, Reclaim The Records would appreciate a reference note in your "about this database" source box, and/or a link back to our website, just to acknowledge the work and initiative that went into researching and releasing these records back to the public. For more information on Reclaim The Records, please visit our website, Like Us on Facebook and/or follow us on Twitter at @ReclaimTheRecs. We're a 501(c)(3) as recognized by the IRS, our EIN is 81-4985446, and donations are tax-deductible in the United States to the amount allowed by law. If you have any questions or issues, please reach out to us at [email protected]. Thank you to the New Jersey State Archives and their executive director Joseph Klett for their help tracking down records for this project. Thank you to our awesome OPRA attorney CJ Griffin of the law firm Pashman Stein Walder Hayden for helping us win the first-ever public access to these public records. 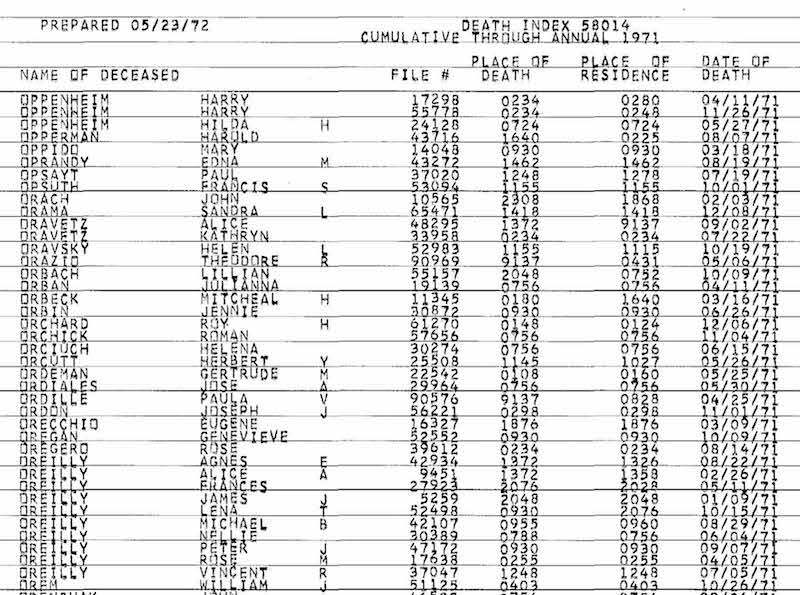 Thank you to the Internet Archive for providing free web hosting for the more than 500,000 images of the death index. Thank you to the New Jersey Department of Health for fulfilling our OPRA request quickly, and not making us have to file a lawsuit against them.